These photos are from visits to the California Institution for Men (CIM) and the California Institution for Women (CIW) by Community Based Art/Prison Arts Collective (CBA/PAC), a collaborative team of teaching artists and interns overseen by founder/director Annie Buckley. CBA/PAC is based at California State University-San Bernardino, where Annie is a professor. 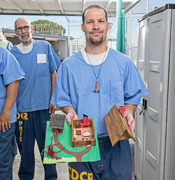 Both of these programs were part of a yearlong Demonstration Project for Arts in Corrections, an initiative of the California Department of Corrections and Rehabilitation and the California Arts Council.